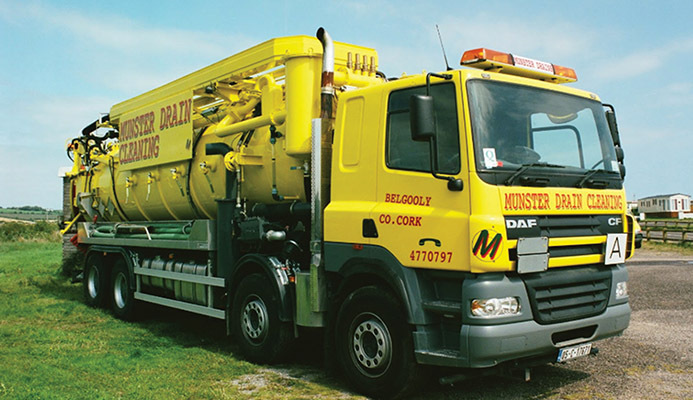 With close to 30 years of experience in its work field, Munster Drain Services in Belgooly, Co Cork has grown to become a leader in the Irish drainage industry. Irish Tractor & Agri caught up with John Daly, who is the company’s founder and subsequently the man behind its success. Since setting up the business in 1987, professionalism and safety have been the two top priorities for Munster Drain Services’ Managing Director, John Daly. That, above all else, is a huge part of the reason why his company still continues to thrive to this day. Indeed Munster Drain Services has grown steadily over the past 29 years, thanks in no small way to the loyal support of its many customers, both past and present. Working throughout the Industrial, Commercial, Local Authority and Domestic sectors Munster Drain Services have built up a solid reputation with the services that they provide. The experienced team at M.D.S utilizes the widest range of the most up to date and specialized equipment available and the company has earned itself a reputation for providing the highest standards in training, unbeatable customer services and environmental responsibilities in their business. As its founder, John Daly has been the driving force behind the business and its growth over the past three decades. “We’re here in Belgooly, Co Cork and we are established since 1987,” explained John. “Basically, we’re specialists in drain services and do everything from large jet packs for commercial and pharmaceutical plants to drain and manhole testing,” he said. As the name suggests, drain services is a key aspect of the business for M.D.S, with their extensive fleet of combi-jetting systems capable of dealing with every drainage project, each utilising the latest developments in jetting and suction technology. Their combination units are capable of jetting at 100 gpm, cleaning pipelines up to 1.5 meters in diameter and distance up to 300 meters. M.D.S operates an extensive fleet of combi-jetting systems capable of dealing with every drainage project, each utilising the latest developments in jetting and suction technology. Each combi-jetting unit can remove silt and debris from drains, culverts and sewers as well as wet wells, digesters, deep soakaways, sludge tanks, interceptors and catchpits. Carrying a variety of jet nozzles and root cutting systems, each unit is well equipped to cover every operational eventuality. The units that M.D.S have are capable of recycling jetting water, minimising waste usage and operating at super silent mode, since it is often difficult to identify what problems lurk in drains and sewers until work is proceeding. With 30 years of practical experience, they have all the tools and expertise to deliver a solution for every problem. Offering the total cleaning service – the company utilises high pressure water jetting to achieve free flow in drains and sewers. Arisings are collected using their powerful vacuum systems. Indeed a lot of the equipment that M.D.S. operates with can be boasted as state-of-the-art. “We have 20 vehicles on the road now from when we started and we’ve bought so new equipment this year for some of the projects that we have coming up,” said the MD. “The vehicles that we have are four MAN trucks, MAN jet packs, DAF trucks, four Ford Transits and recently bought four Citroen Berlingos. We also have Volkswagen, Mercedes, Isuzu and Toyota Jeeps and a Toyota Avensis car. The company’s contract with Irish Water is one that has been agreed upon recently, with Water Services having putting forth a 25-year strategic plan for clean and safer drinking water nationwide. So why were M.D.S chosen above other competitors for their contract? “All of our people are trained to the specific requirements,” John outlined. John’s own background explains where the company’s specific touch with customers comes from. As a plumber, he didn’t just learn about pipes and drainage but discovered more about the human aspect of the business and having to tend to the customer’s requirements. “I’m a plumber by trade and once I became qualified I moved into drainage and I built my experience from there. I eventually went out on my own and started winning contracts then for different jobs,” he said. And it will always continue to be so long as John’s at the helm. In a policy statement to employees, customers and visitors, which can be read on the company’s website, John outlines the crucial aspect of Health and Safety. “It is the Policy of this Company to protect, so far as is reasonably practicable, persons not employed by this Company who may be affected by our activities,” it reads. “It is our objective to provide, so far as is reasonably practicable, a safe and healthy work environment and it is our plan to meet our obligation’s as prescribed in the Safety Health & Welfare at Work Act 2005, (No. 7 of 2005) and all the subsequent regulations. “The allocation of duties for safety matters and particular arrangements to implement the policy are set out in the Company safety statement. “The policy will be kept up to date particularly as the business changes in nature and size. To ensure this, the policy and the way in which it has operated will be reviewed as required. As for the New Year, which has brought about new business, John is intent of following the trend which has seen the company develop into a success story down through the years. “We intend on growing the business again, get more new contracts and start some new projects,” he concludes. 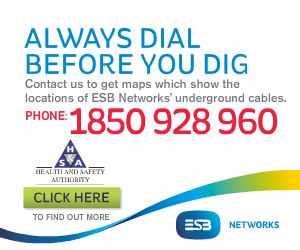 So if it’s drain service you need, whether it be cleaning, underground pipe rehabilitation, CCTV Surveying, tank cleaning or robotic cutting, look no further than Munster Drain Services.